– Charles Schwab - billionaire, ﬁnancier, and founder of Charles Schwab & Company; has dyslexia. Lemon Tree was founded in 2007 by Maria Saravanos, MA/CCC-SLP, a Florida licensed and certified speech-language therapist whose passion and purpose is to help children and adults embrace and overcome their learning differences. Maria received her Master’s degree in Communication Sciences and Disorders from the University of Florida in 1998. At the University of Florida she received intensive training in diagnosing and treating language-based reading disabilities at the University’s Reading Clinic, under the guidance and supervision of her mentor and “guardian angel,” Dr. Linda Lombardino Ph.D., CCC-SLP. As a graduate student, Maria worked as a research assistant in a grant supported research study examining the neurobiological differences in individuals with dyslexia, using functional magnetic resonance imaging. It was during this research study that her passion for learning differences was unearthed. She too had experienced chronic frustration and disappointment with learning as a child and she easily identiﬁed with the students’ struggles. Upon interviewing and testing the university students with dyslexia, Maria was hearing her own story recounted in their personal tales of defeat, stress, and frustration. There were so many stories and they all spoke of the same message. The majority of the students had passed at least one-quarter of their lives thinking they were failures and they were to blame. It was at this point in her graduate career, that Maria made it her mission to build awareness, educate, and advocate for children with learning differences. After graduating from the University of Florida, Maria worked as a speech therapist in a variety of settings including pediatric outpatient therapy (All Children’s Specialty Care), private practice, preschools, elementary and middle schools, as well as home-based settings, while always having a special place in her heart for students with language-based learning differences. Living with an unidentiﬁed learning disability enabled Maria to develop an undeniable understanding and compassion for children who learned differently. Her inherent understanding of different learning styles coupled with her specialized training enabled her to devise teaching strategies that unlocked educational potential. From her learning disability, Maria also learned the invaluable lesson of making the best with what you are given. “When life gives you lemons, make lemonade” became one of Maria’s teaching mantras as it was a simple philosophy that carried her through some of the most trying times in her educational career. Maria encourages her students to embrace their learning differences openly and conﬁdently and trust that one day, their learning difference will become their greatest gift! At Lemon Tree we believe everyone is created with unique strengths and weaknesses speciﬁcally tailored to fulﬁll their intended purpose. We celebrate our differences - gifts and challenges - and never hide from them or wish them away. They were given to us for a reason. 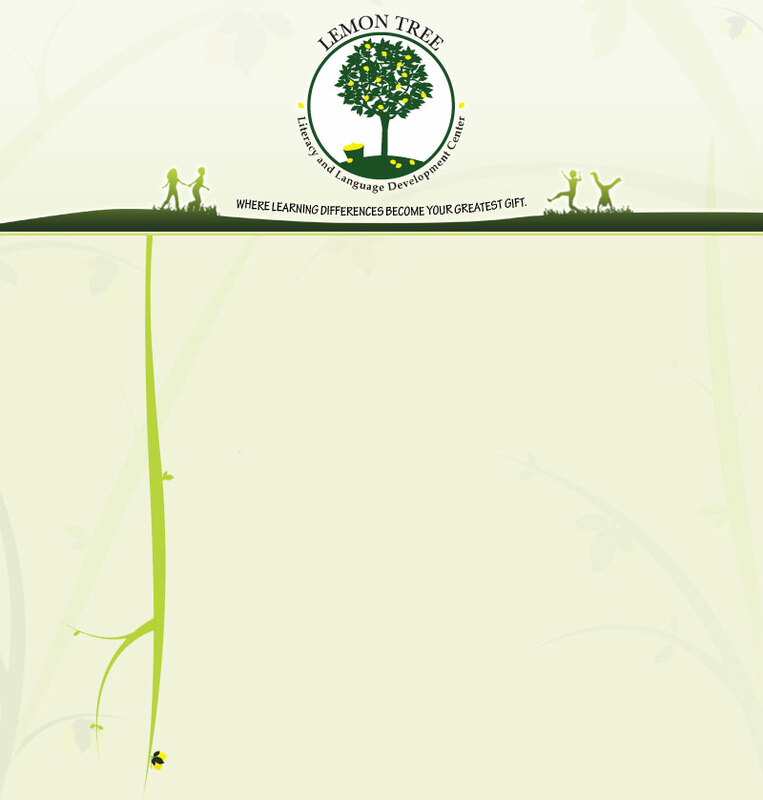 At Lemon Tree nurturing and supportive therapists encourage students to increase awareness of their learning differences, and promote the development of their identity as successful learners. Challenges that come with learning differences are accepted and embraced with open arms. By coping positively with challenges, students strengthen their character and learn to develop patience and faith early in life, and most importantly, learn ways to overcome adversity. • persevere in the face of adversity and accept obstacles as part of the learning process. • embrace challenges and turn them into the opportunity they were intended. • believe their learning difference will one day become their gift.